When baby number one was still an infant, breastfeeding and naptime were spent soaking up parenting books. Many of my friends were in a similar stage in life and were eager to swap stories and suggestions. Expert advice and the support of friends and family helped keep the threat of being overwhelmed at bay. Fast forward two-and-a-half years, here comes baby number two, and everything is different. Parenting books? No time for reading. Friends? Sure, but none of us had energy for endless chats on the phone. Conversations with small children underfoot were limited, and babysitters weren’t cheap. Only, I still had questions, still needed advice, and still wanted a support network. Enter the blogosphere. Everything was there, but mining for gold through so many parenting blogs was often an exercise in frustration. I’ve put together a list of some of my favorites in the hopes that it might save you some time and that the blogs might provide you with sources of inspiration, information, and laughter. Alex shares her trials and tribulations as a mother with humor and insight. In one post, she writes about her decision to turn her back on a career as a medical doctor to stay home with her son, and in another post she gives tips for farting in public. I never know what I’ll find on this blog, but I know it’ll be good. Be a hipster and go local on this one. You won’t be sorry. I have to tell you, my Facebook newsfeed is depressing. Too many pretty faces caught in perfect moments can make me feel like an underachiever. Don’t get me started on Pinterest. Stephanie’s blog, Mommy, For Real, offers a reality check by writing the things that every mother thinks, but most of us don’t have the guts to say. Reading this blog is like an intimate chat with a girlfriend. Lydia pulls no punches in exposing the underbelly of parenting. She is hysterical. Posts with titles like “Chuck E. Cheese is Satan’s Playground” and “The Sleep Wars: Baby vs. Momma” give you a taste of Lydia’s style. However, if you’re offended by cursing or potty humor, this is not the blog for you. I’ve decided instead of cooking, I’ll just stare longingly at the photographs of dishes Ree posts on her blog. Really, I think this is a good diet plan. In addition to recipes, this site also includes her thoughts on entertaining, family life, and homeschooling. She’s the new Martha Stewart (without the pretension). The evening news scares me into believing that the world is a dangerous place and my job as a mother is to provide around the clock bodyguard protection for my children. Lenore Skenazy takes on helicopter parenting by questioning the nanny state we are creating. Her arguments make me uncomfortable, but in a good way. Irrespective of the name, Charlie and Andy offer little how-to, but instead loads of laughter. My first taste of this blog was a description of the two heroes awakening with a hangover and misspelled tattoos. Now that’s just funny. Other topics include “5 Parenting Lessons from Bill and Ted” and “6 Secret Uses of Baby Diapers.” This blog also provides the valuable experience of seeing parenthood from different perspectives. This site is a catch-all. Categories it covers include: mom stories, tips and tricks, celebrities, global moms, life and home, and products and prizes. Here’s where you come if you want to catch-up on the latest celebrity pregnancies and children, but it’s also where you come for advice on sleep, recipes, and crafts. If you don’t know where to find it, this is a good place to look. Clinical psychologist Dr. Laura Markham offers tips on parenting children from infants through teenagers at Aha! Parenting. Dr. Markham is a nationally recognized expert who advocates “win-win parenting.” If you are curious about attachment and connection parenting, this is the blog for you. Blogger Ellen is a Catholic working abroad in a school in Iraq. She shares her thoughts on raising a family in faith. I love her take on encouraging risk-taking, autonomy, and critical thinking in our children. In addition to her thoughtful blog posts, she also posts lesson plans for Bible study. Heather writes for all mothers on topics ranging from SIDS to breastfeeding, but she also has posts that are of particular interest to African American women and single mothers. Ready to hit the dating scene? Stop here first. One of my favorite aspects of her blog are her video diaries. JD writes about life as a young, working mother and military spouse. Examples of posts you’ll find here include timesaving tips for working mothers and advice on preparing for deployment. Dr. Marilyn Price Mitchell offers advice to parents and the community at large on how to develop children’s internal compass. Topics she covers include: resilience, learning, social skills, caring, self-awareness, creativity, strategy, and character. 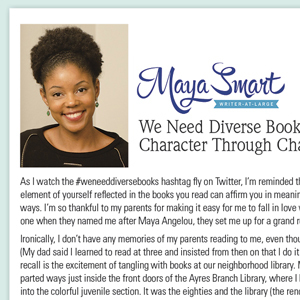 See Mia Wenjen’s blog for children’s and YA book recommendations, ideas for supplementing education at home, and parenting tips. Two niche areas covered in her blog are teaching foreign languages at home and resources on learning disabilities. I’d be remiss to omit RFM’s own blog Parenting-by-the-Book. Every month Victoria Winterhalter summarizes a different book on parenting. Her posts are like CliffsNotes for parenting literature. By its very nature this blog highlights a variety in parenting philosophies, which I find helpful in developing my own perspective. Another local blogger, Maya Smart writes about “women’s pursuits of happiness and meaning.” As this includes motherhood, I’m including this blog on the list, but her blog focuses on more than parenting, as it also reflects on topics like leadership, style, and creativity. As a woman who sometimes struggles with losing my self in my motherhood, I find Maya’s perspective encourages me to see beyond my perceived limitations. Sherry and John document their home transformation here. They include plenty of stories of life within its walls with two children and a dog. Want to make a play kitchen or sew a beanbag pouf? Then make this a blog stop on your tour. You’ll find loads of decorating tips for grown-up rooms here, too. Enjoy your tour of my blogosphere favorites. Wishing you many heartwarming, belly-laughing, and thoughtful reads. Mary Helen Sheriff has an MFA in children’s literature and has taught elementary, middle-grade, and college students. She lives in Richmond with her husband, two children, and two cats. She blogs about writing and education.